Any decent motorfactors can match up strut dust boots from kyb or monroe range. Some people used vw golf ones in past . How do coilovers get away with it? teins and the like don't have them? We might be a while with all the heads he has been polishing he is worn out. Joe your suspension are GAB aren't they mate? Did you read what the label said on the part of the strut that sits inside the springs? Also have your rear struts got a dial half way up the strut for damping adjustment? front have those adjusters and gab logos but rears dont. Not much of an update really. Went to fit my rear brakes yesterday, BiggRed Refurbished rear calipers and new pads and disks only to find discs dont fit they are too big. I guess i got sent the wrong ones. Anyway I've ordered new discs and and pads should be here this week. 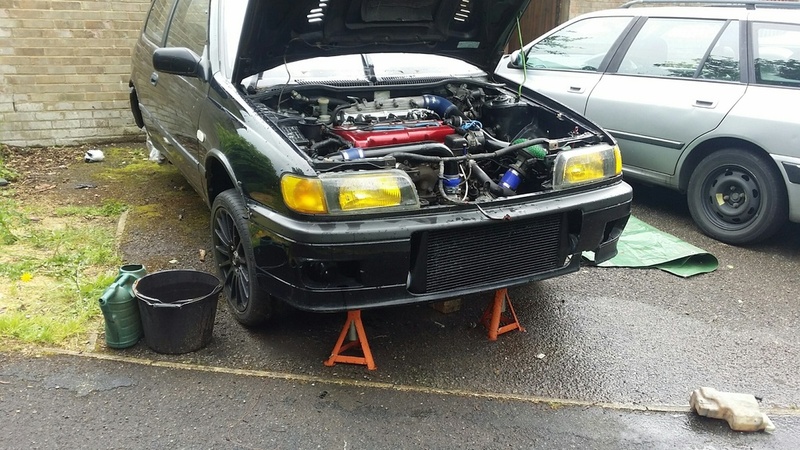 I havent been able to afford welding for last few months due to lack of fund so car hasnt moved. However just been able to secure a deal with my work to pay me over time for next few months as im currently salaried. So ive smashed the over time over last two weeks and that should cover the cost of welding as well as new tyres for the rear or syron street race tyres all round. Sounds like a lot to do before the 20th but its just small jobs. Probelm is finding time, currently doing 10-11 hour days 7 days a week and training 4 nights a week plus having family life. Im sure i can figure out a way to squeeze in these jobs. Hopefully get it all done in time mate, its all the small jobs that add up and take your time. Not any pictures as of yet but a bit of an update. Had a new flexi welded into the exhaust as well as an o2 bung. that is now fitted to the car and works nicely with the wideband o2 Sensor. When warm and idle its reads around 14-15 on AEM. When you rev it when stationary it seems to lean out but this will be checked when mapped. 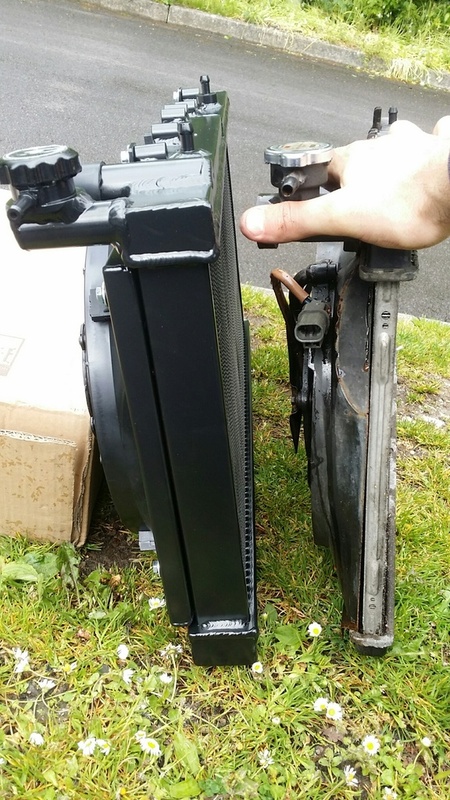 im in need of a alloy overflow bottle for the radiator as well if any one knows of any good ones. 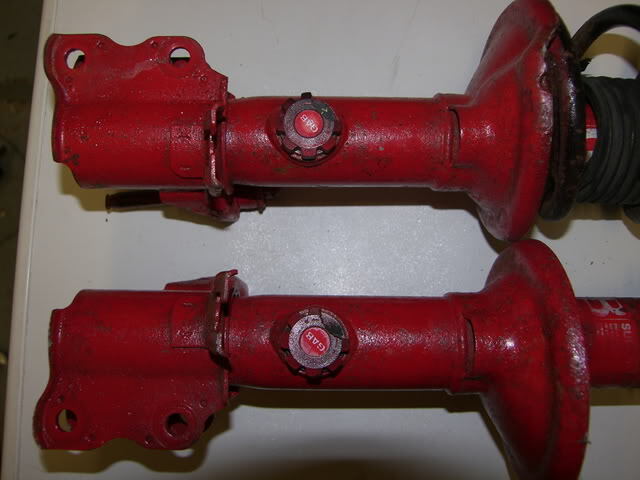 also would like to replace some hoses in the bay with braided hoses to help reduce temperature effects etc. Any link for the brake bleeder ? so here is a few pictures for an update. Trying to figure out how to wire up my washer bottle. I put multimeter on pink and wtr to black on the battery and its constant 12V and when you try to activate the washer it drops to 0.3V. I would of thought i would normaly be 0V when you pull the stalk it would then send 12V to wiper motors. May need to rethink this. Found a hole in my sump pan. So ive ordered a new one, while im at it im going to replcae the oil tempreture sensor. New sensor was £55 from nissan absolute joke. and then give it new oil and filter ready for the road. Went to bleed brakes, bleed all of them with pressure bleeder...Started the car and front drivers wheel was not moving when car was in the air and in 1st gear. It looks like the caliper has siezed. So had to order new caliper and now have to rebleed the brakes. Got my tyres fitted yay! Gapd my spark plugs at work to 0.7mm +-0.01, they are now ready to be installed. Will also check my transfer box oil level and top up. car is meant to go off for welding this week. As i want to change my alloy wheels in future for wider wheels i will need bolt on arches. 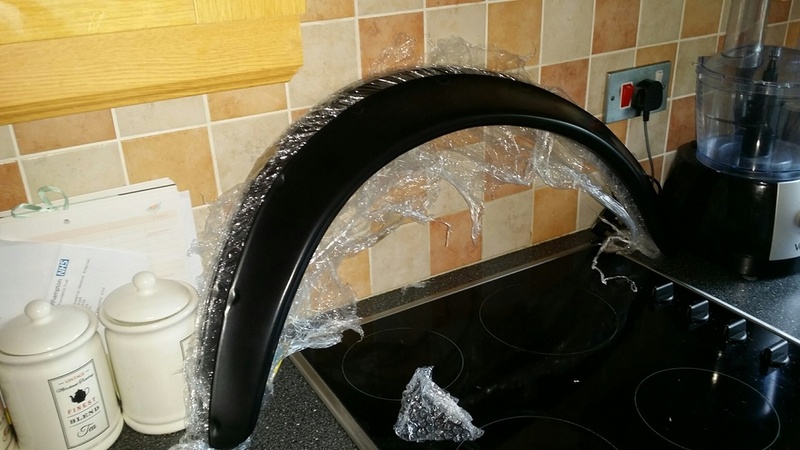 So im going to get my rear arches tubed and arches ordered. this should also save money at the welders rather than them have to weld in new panels completly flush. 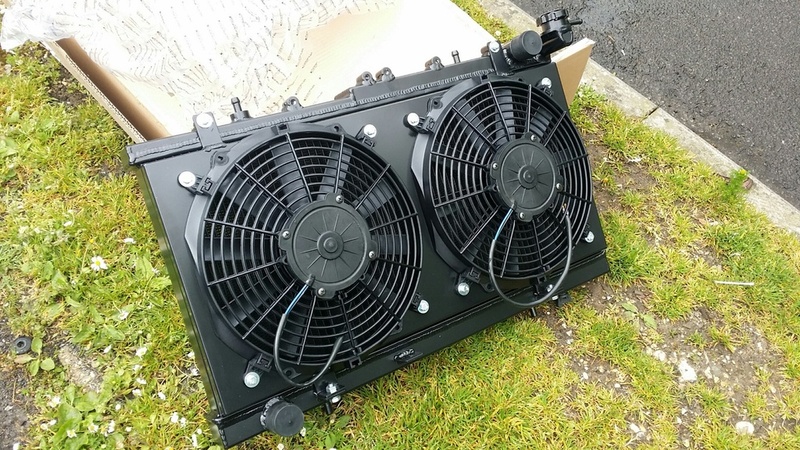 I got a new radiators as wanted to upgrade mine before it goes back on the road. Its got two slim line fans and shroud. from the pictures below you can see the size upgrade. Just looking for an alloy over flow tank now. What shroud did you buy ? @johnny gtir wrote: What shroud did you buy ? It came with the radiaotr as a complete kit. @johnny gtir wrote: Mishi moto rad ? No I would of loved a mishimoto one but had to settle with what my pocket could afford haha. This is one I saw on ebay. It was 170ish two year warranty. Welds look very good. Only worrying thing is turbo is about 10-15mm away from the fans. 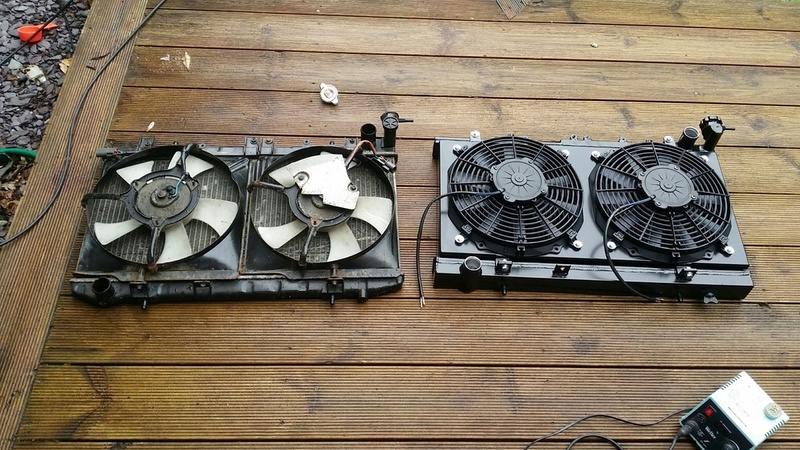 Even though the fans sound like a jet fighter when on I am worried heat from the turbo will melt the plastic fans. -New Oil temperature sensor fitted. i traced the water temperature sensor back to the ECU. 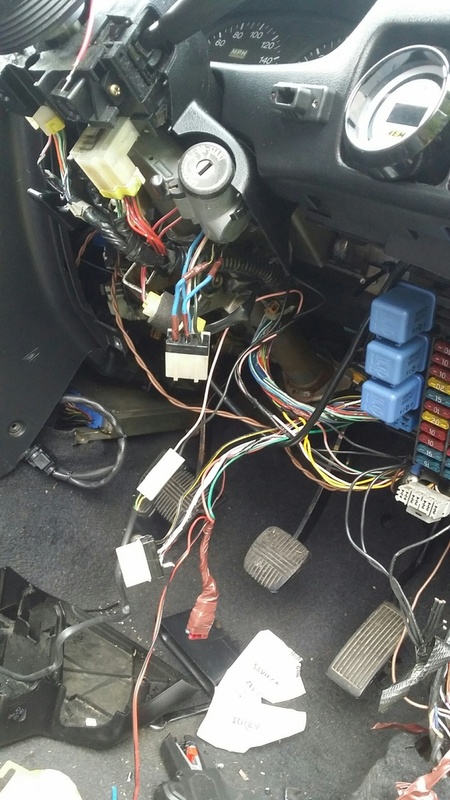 its 300ohm between ECU and engine bay connector. I believe it is 300ohms due to the speedo coil resistance. 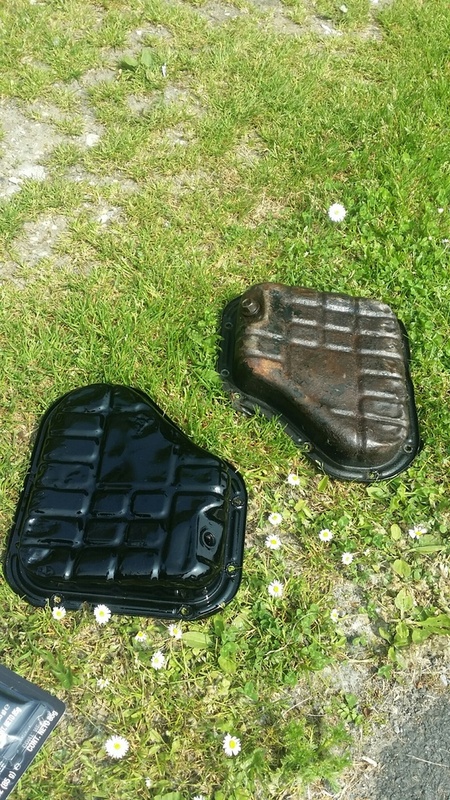 -replacement sump pan arrived to be fitted this evening. Looks like it was the slider pins sticking on the old caliper so ive ordered new rubber boots and slider pins then i will complete fitting the caliper and re-bleed the brakes. Still trying to sort out why it takes 4-7 attempts to start my GTIR when cold. got round to fitting the new sumppan over the weekend. 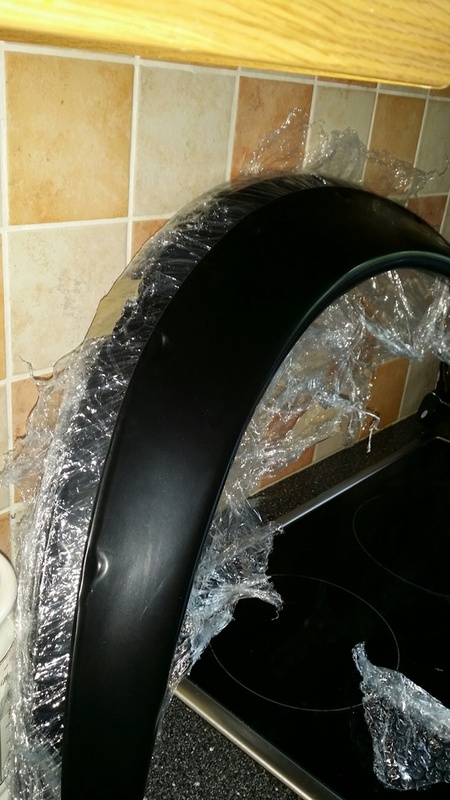 Mine seemed to have a micro hole in it, that seeped oil. Anyway my new sump pan turned up but needed stripping and spraying as it looked like the one car. So got the grinder out stripped it back and repainted it with some high temperature engine paint. I thought i had drained all out the car, note to self; if no more oil comes out the sump plug this does not mean all the oil is out. I took the sump pan off to have about 1 litre of old oil go on the drive. 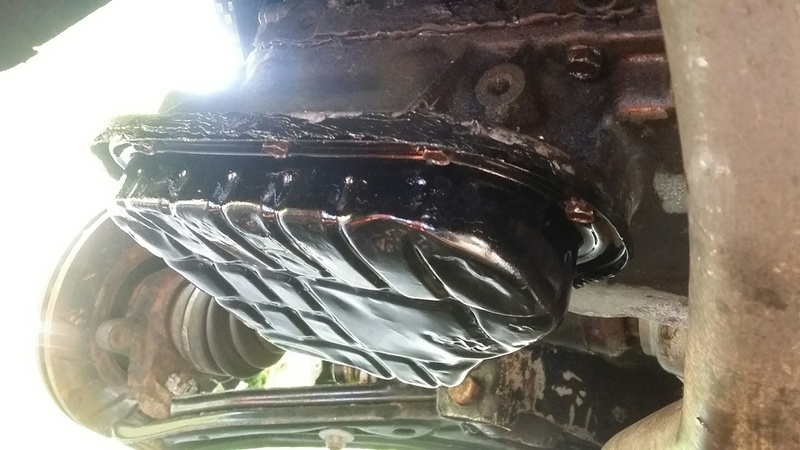 Anyway after clearing that up, and fitting the new sump pan using loctite black. I went to top up the oil. Note to self; when changing sump pans ensure sump plug is fitted. 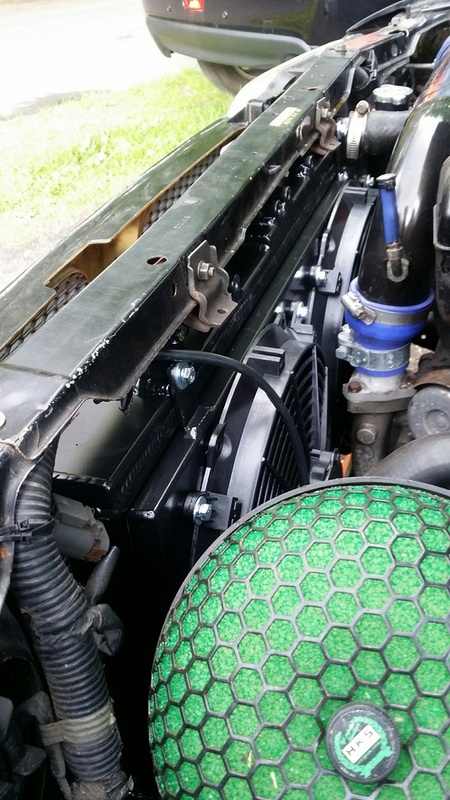 Not checking the sump plug was fitted i filled the engine up with 3 litres of oil. To then check the dip stick to see no oil on it. Well this is wierd. 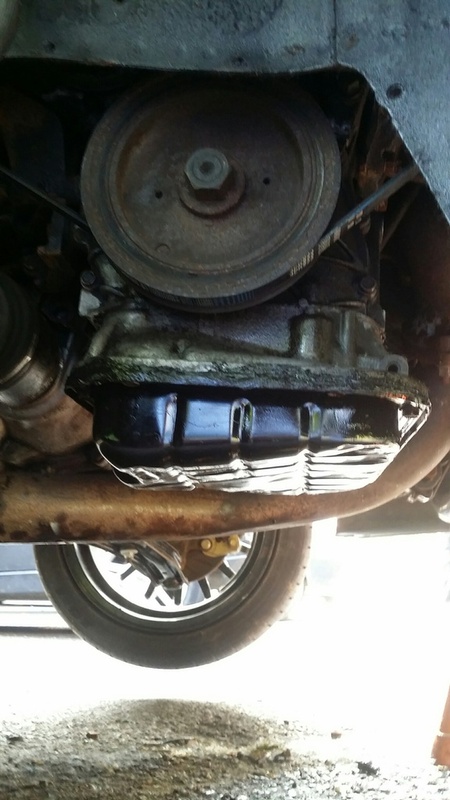 Look down and see my drive covered in 3 litres of new oil. Moving on i cleaned up the mess and set about fitting the sump plug and repeating. All is good now. However oil temperature gauge is not moving, so now need to see if there is either an inline fuse that has blown or the oil temperatuer sensor is wired up wrong (reads 1kohm when cold) havent checked resistance when warm. Also bought my self some 2" arch extensions. This will cut the cost of welding as the rear arches can now be cut and tubed rather than fitting in new arches, filler and painting. Flares are a good idea to fix your arch problem, r u just going to space your wheels out? @gtir_woody wrote: Flares are a good idea to fix your arch problem, r u just going to space your wheels out? No will be getting new wheels. I know the wheels I want but can't justify the amount. I want some volk te37v et0 16 8j wheels but can't justify £1000. Don't want anything that weighs too much as trying to keep unsprung weight as low as possible.